Review: Set in the early 18th century, in which Queen Anne holds the throne while her kingdom is at war with the French. Set in the early 18th century, rivalry starts when a new servant Abigail arrives on the scene. Abigail and courtier Lady Sarah Churchill both vie for the affections of their monarch, Queen Anne. A part of history that I knew nothing about. For me this film just didn’t work. I found I couldn’t engage with it at all. The two things that impressed me the most was all the costuming and the cinematography, especially the use of the wide-angle lenses. 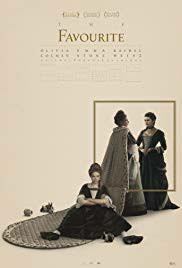 This is the second film I have seen directed by Yorgos Lanthimos, the first one being Dogtooth (2009) and I have to say that I am not a fan of that film either. I did find the music at times very weird and disorientating, As good as Olivia Colman, Emma Stone and Rachel Weisz were, I do think that the strongest performance came from Nicholas Hoult. In order for Olivia Colman to play her part she had to gain 2.5 stone (16 kg. or 35 lbs.). Apparently Kate Winslet was originally cast as Lady Sarah Churchill but dropped out. This is the second time that Rachel Weisz has had to take over from Kate Winslet, the first one being The Mercy (2018). Rachel Weisz and Nicholas Hoult starred together in About a Boy (2002). Queen Anne had built Blenheim Palace for Sarah Churchill. Winston Churchill has born in the very same palace and it was a family home for 300 years. I felt that the ending was a bit on the flat side and it just ended abruptly. I thought that during the credits it would give us some facts about Queen Anne for example how she died etc but there was nothing. I was not won over by this but I admire it and what they have achieved. I do think it is a story that does need to be told. At the Golden Globe Awards in 2019 Olivia Colman won for Best Performance by an Actress in a Motion Picture – Musical or Comedy. At the Bafta Awards in 2019 this won 7 Awards. They were for Outstanding British Film, Best Leading Actress (Olivia Colman) and Best Supporting Actress (Rachel Weisz), Best Costume Design, Best Make up and Hair and Original Screenplay and Best Production Design. At the Academy Awards in 2019 this won one Oscar for Lead Actress (Olivia Colman). Nice review, saw this with Lucy and enjoyed both the history and the unconventional way the director set out to tell tell the story but agree that at times it fell flat.